Portland's favorite acid-psychedelic-pop-rock act King Black Acid is back with a four-song EP, their first release in a year, and something for fans to nibble on before their next full-length on Cavity Search Records hits. The opening, title track plays with your mind as frontman Daniel Riddle's vocals and lyrics provide a pop-rock atmosphere for you to enjoy while the band delivers twisted acid-rock in the background, creating psychedelic visuals in your head and leaving you frozen in place as the keyboards pitter-patter around the song, the drums prance, the bass quietly makes its mark, and the guitars push you forward into a trip you won't soon forget. "Born to Sleep" provides the perfect soundtrack for your dreams, resonating with such subtle beauty you can't help but feel mesmerized. Polished, yet spontaneous, the song delicately floats around your ears while it eases into your body and sends a warmth up and down your spine like you've never experienced before. A steady, steamy instrumental, the song longs for you to sit down and just relax with it, forgetting about the rest of the world and just hearing the notes that come from your speakers. "Where Ever It Is You Are" jars you back awake with Riddle's potent, damaged lyrics that ring with so much pain and truth you can't help but latch on to them and feel every breath he uses as the words escape from his mouth. 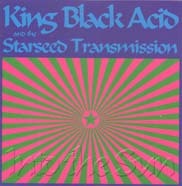 And the "Into the Sun (remix)" that closes out the EP reminds you of the force that is King Black Acid. KBA is a musical establishment that has to be heard as well as seen. The band can transform even the hardest of skeptics into fans and have no problem putting you into another dimension when their music runs through your mind. They truly have a way with music that is unlike anyone else. I'll give it an A-.